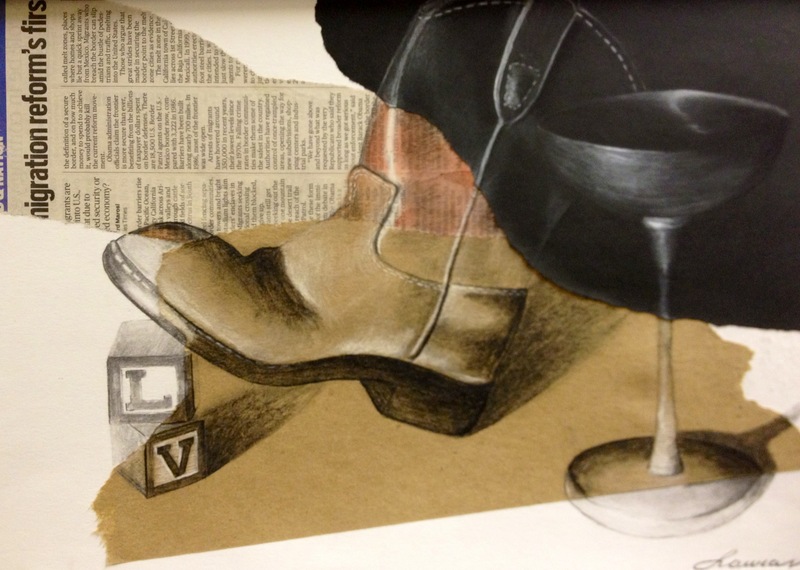 This lesson was inspired by the art teacher Alex at Art Roominations in a lesson called “Mixed Media Still Life“. She found the image on Pinterest (as I did too) & was inspired to create a high school observational drawing lesson from it. Objectives: Students will review drawing observation skills. Review how to judge angles of objects and the slants of the contour edges by using the sighting techniques. Learn the five elements of shading. Review the value scale & shading techniques with charcoal, pastels & drawing pencils. Chiaroscuro is an Italian term that translates to mean light and dark. Leonardo da Vinci pioneered this technique during the Italian Renaissance in the late 15th century. Early chiaroscuro drawings were done on toned paper, with one light chalk (such as white) and one dark chalk (such as dark red, sepia, or charcoal). Many artists after Leonardo made effective use of this technique, but one of the most notable among them is Rembrandt. TIP: You MUST know where your LIGHT SOURCE is coming from in order to shade effectively! Project Objective: Create a mixed media realistic drawing of a group of 3-4 objects with FULL shading. Use good drawing observation skills to draw the still life accurately then render with FULL shading using the designated media below. Include all 5 Elements of Shading where applicable. Prepare surface one class in advance: students collage a scrap of newspaper, a piece of black charcoal paper, and a scrap of brown craft paper onto a larger white sheet of drawing paper 12×18″. Choose 3-4 objects to draw from the still life boxes. No more than two can be fruit (only 1 simple fruit), the rest must be objects. Arrange the still life in an interesting composition on white paper with a spot light. Use your iPad to take pictures of the composition. Crop in closely to the arrangement & make sure we can see highlights & shadows. Draw out your composition onto your prepared paper using a 2h drawing pencil. Draw it so that it crosses over all of the different papers-make it go off the page if you have to. Make sure your drawing is as accurate as you can draw! In each of the different papers, use the designated mediums to render the drawing with FULL shading. When completely finished, LIGHTLY spray drawing with hair spray to “fix” the charcoal & pastels to the paper. Did you use an adhesive to stick the other pieces of paper to the drawing paper?